Welcome to our first blog post on Parenting Rights Institute. 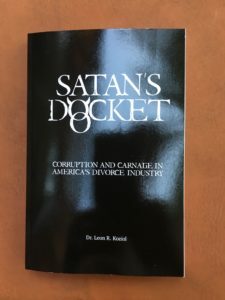 Today we are introducing the advance release of our director’s new book entitled, Satan’s Docket: Corruption and Carnage in America’s Divorce Industry. Nine months in the works and based on thirty years of litigation experience, Leon Koziol takes you through his horrific ordeal as a judicial whistleblower forced to seek protection in Paris. However this book is much more. It can be considered a crash course in divorce or family court, your education to an epidemic that is harming our children, families, schools, workplaces and health as a nation. It was a herculean project, years in the research and writing stage with a manuscript completed only last month. At present it is the hands of a major publisher with a possible release date early next year. In the meantime it has generated inquiries from a documentary producer and will hopefully lead to an overdue investigation by Congress or Justice Department into federal funding abuses in state domestic relations courts. We will keep you posted on this. While all this was in progress, so were the many family judge elections across the country which promise to expand this epidemic and bring even more harm to future generations. One such election in Oneida County, New York sparked the early release of this uncensored version of Satan’s Docket. Its author and our director, Dr. Leon Koziol, resides in that county and became troubled by the lack of vital discourse on the real issues in these courts. In coming weeks, he hopes to change all that through this unprecedented literary work. Satan’s Docket was also inspired by former New York Senate Leader Joseph Bruno, whose memoir, Keep Swinging, was released in November, 2016. Dr. Koziol’s book features two equal length halves. Part One is the Corruption segment of his subtitle. It is the macro part which describes a divorce and family court epidemic nationwide. Part Two is the Carnage half which focuses on his personal ordeal. In order to keep a broad section of readers glued to the book, a collection of shocking stories from around the country is spiced with romance, humor and horror in places ranging from Hawaii to Paris, France. It is a book well worth reading at a nominal cost that can save you college tuition and untold lawyer fees. It may be the best investment you will make in years.